In many areas of the country there occurs a simple and soft transition from one season to the next. It is almost as if from one day to the next Mother Nature changes from one color pallet to another to demonstrate the true essence of who she is. This possibility is at your finger tips with the custom jewellery designs available through Krikawa. The process is simple and efficient making the experience pleasant, and not unlike Mother Nature’s transition, smooth and extremely gratifying. The skilled team of craftsmen can accommodate most every desire of the imagination through an exemplary melding together of precious stones and gems of various colors and shapes, different precious metals and design work that will please the most discerning taste. These combined elements make it a singularly pleasing experience to explore your dreams with the design experts at Krikawa. As important as it is to understand the flexibility and professionalism that is incorporated into the birth of custom jewellery pieces, it is perhaps even more important to know that the same skill set, care, and experience is available for custom wedding bands and engagement rings. It seems self-evident that the award winning designs and stellar customer service that are backed by an industry leading guarantee are made to ensure an extremely comfortable transition from idea to concept to finished product. What this ultimately means for Krikawa customers is that they can rest assured from start to finish that the vision they began with will become reality. A continuous stream of communication is the great enabler when it comes to development between the stages of idea to finished goods. 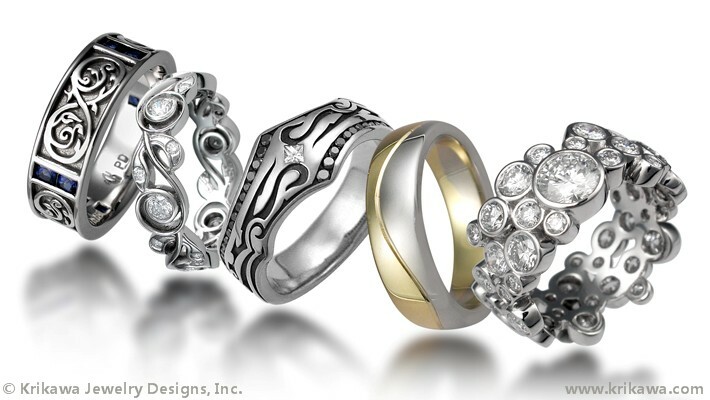 The decision to purchase custom made engagement rings, unique wedding bands or other custom pieces is far different than purchasing stock pieces. The reward speaks for itself. Just as Mother Nature shows her individuality in the transition between the seasons, so speak the custom pieces from Krikawa of the individuality of each and every customer.